mk1-forum.net • View topic - Radford mini de ville colour cards found!!! Radford mini de ville colour cards found!!! Post subject: Re: Radford mini de ville colour cards found!!! I don't think they are. The lower front corner of Australian doors is a seperate piece of stainless, and is more angular and less rounded. Not sure if this one was on here or not. Wow, another early Radford up for grabs! 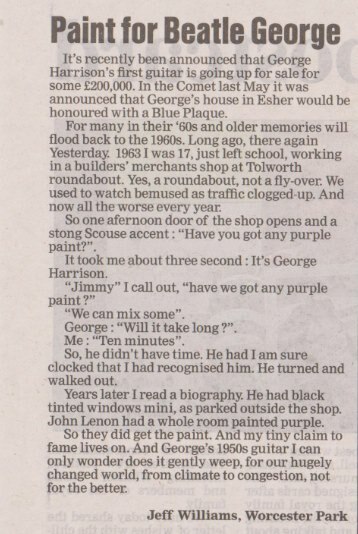 Below is from the letters page of my local paper this week (Surrey Comet)......Note also the Tolworth Roundabout where George Harrison's Mini parks up to visit a Builders Merchant shop is only 5 minutes walk from the Cooper Works at Hollyfield Road, Surbiton. Not normally a Radford fan, but I really like that, looks subtle and classy. Im not sure that window winders made from sea horses is subtle or classy!!!! !